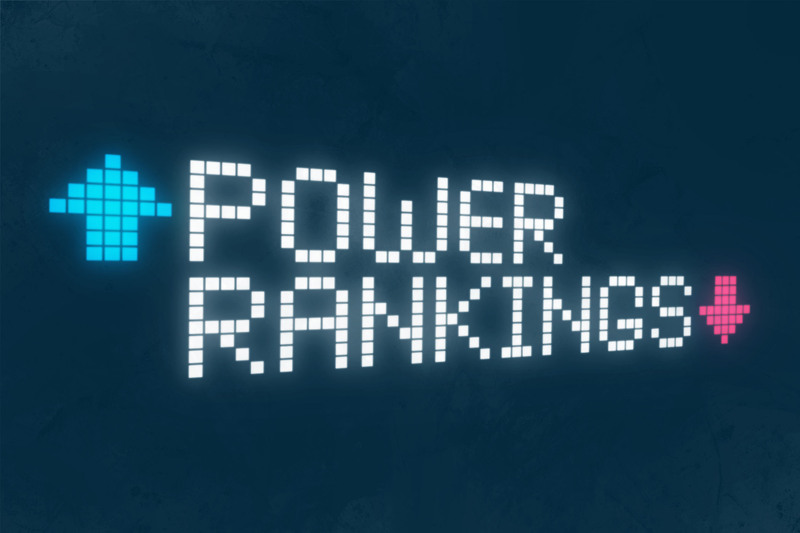 Power Rankings: Week 13 - The Point Data-driven hockey storytelling that gets right to the point. Was there ever any doubt? 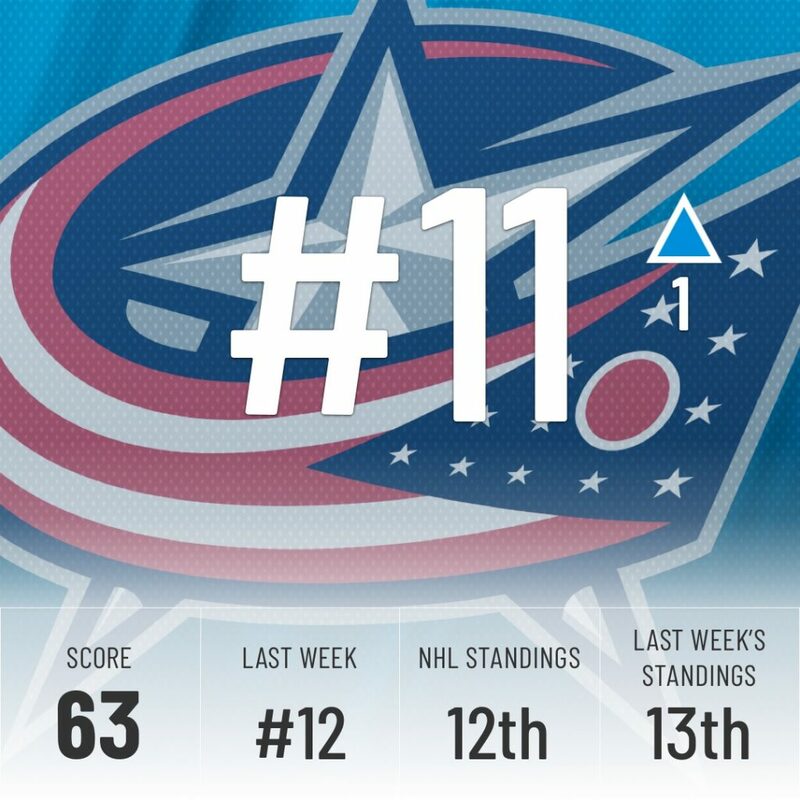 They’re 12 points clear of anybody else in the NHL and have yet to lose 10 games. The gap between them and second place is bigger than the gap between second and 18th. They also received some hardware in our halfway mark NHL awards and Nikita Kucherov leads the league in points. Really, it’s Tampa and then everyone else. 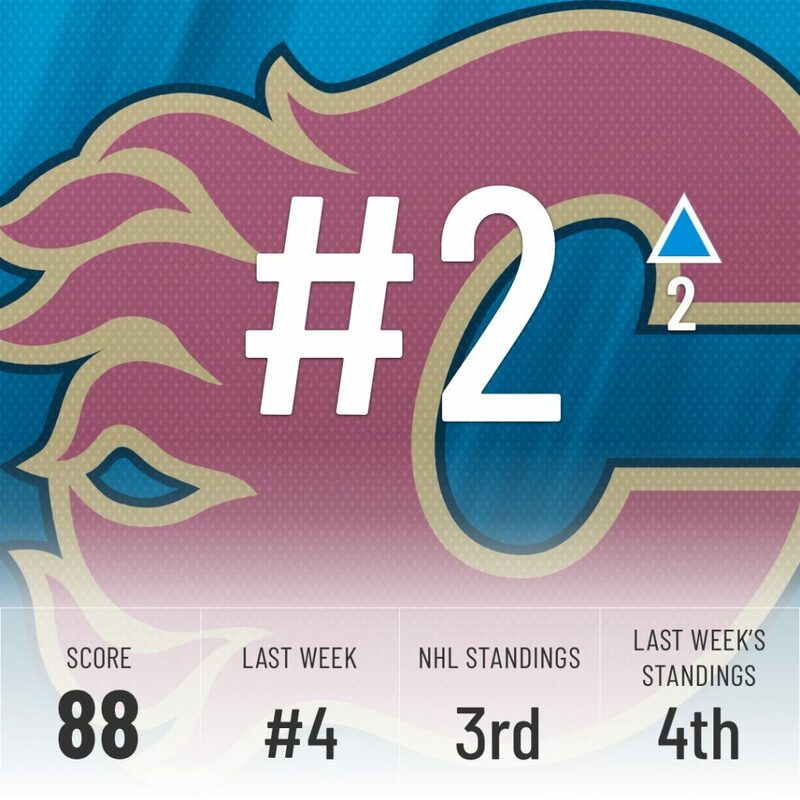 Another team that won some hardware in our mid-season award ceremony, the Flames are currently tied for best of the rest with Toronto, although the Leafs have two games in hand. Johnny Gaudreau has 10 points in his last three games, while Mark Giordano is arguably the biggest All-Star snub and has our vote for the Pacific’s Last Men In. 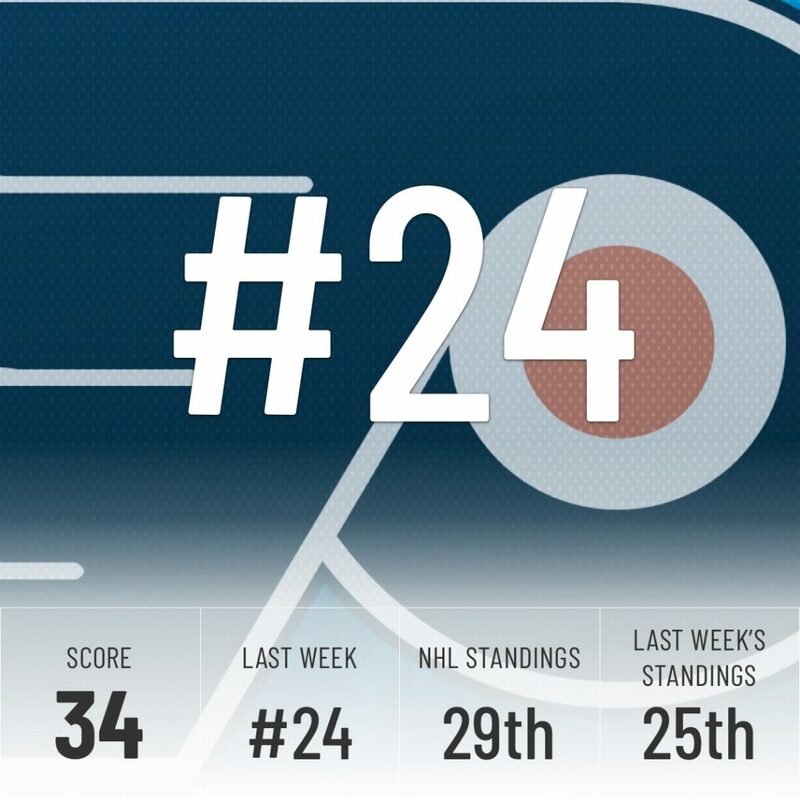 That, coupled with some key injuries in Toronto, moves them in second place of our Rankings. 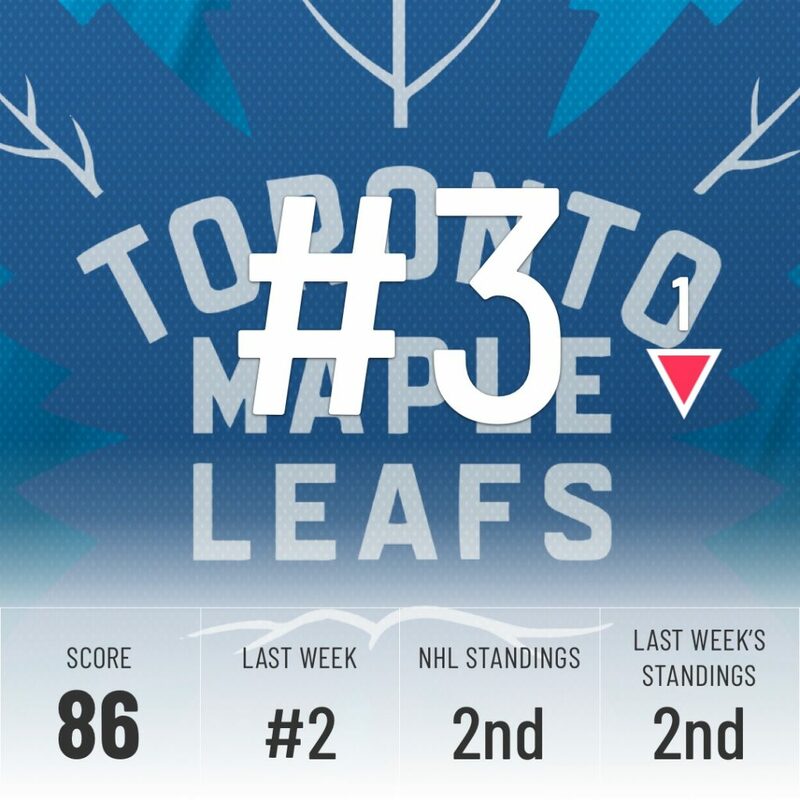 An argument could easily be made to have the Leafs over the Flames in these rankings, but the Super Computer is wary of their goalie situation. With Freddie Andersen on IR with a groin injury and Garrett Sparks out with a concussion, the Leafs will have to get by with Michael Hutchinson and (let me google and copy/paste the spelling real quick) Kasimir Kaskisuo in net. 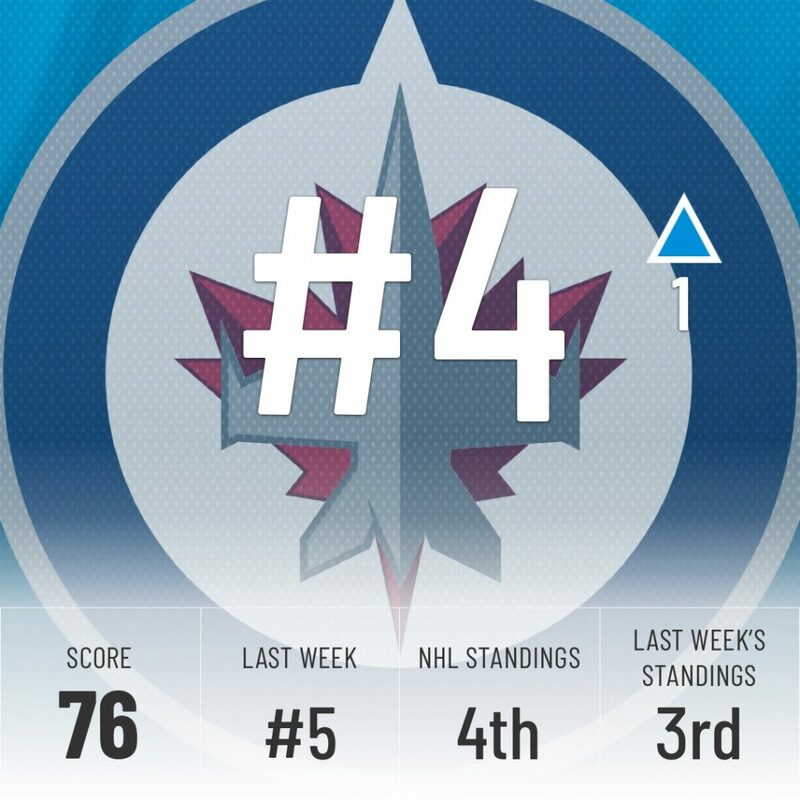 The Jets have not played much over the Holidays with only four games since our last Power Rankings back on December 21st, so the Super Computer didn’t tinker with their place too much, bumping them up just one spot, but that has more to do with the Sharks falling than anything else. 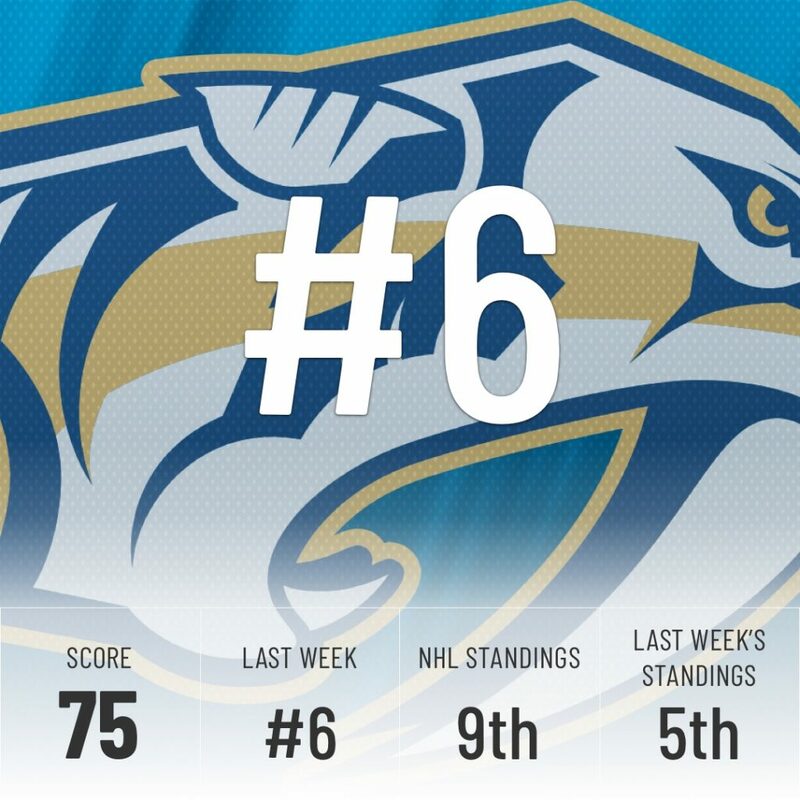 They’re now on par with their place in the NHL standings. 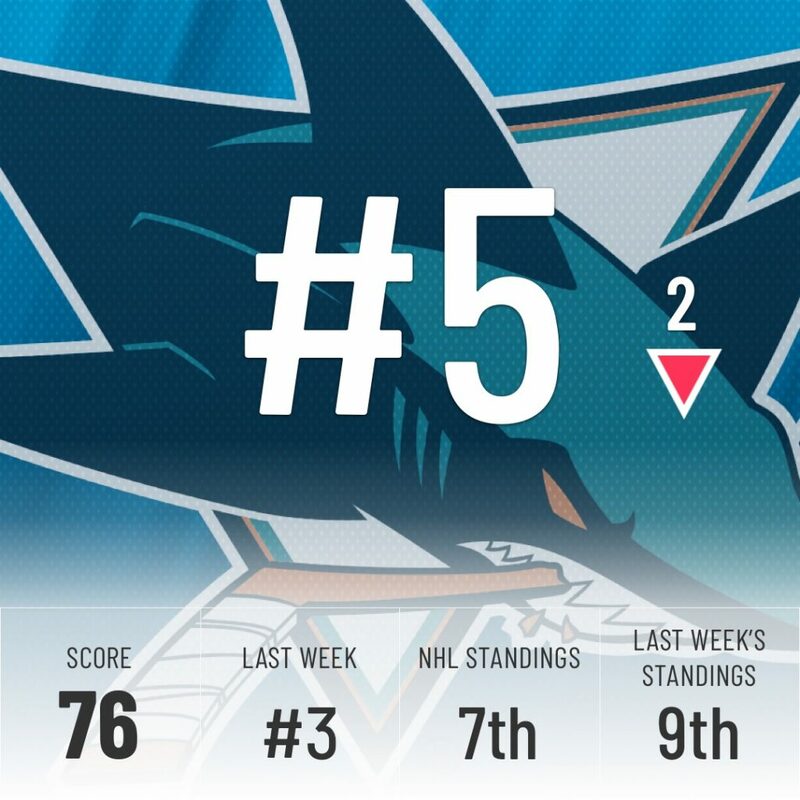 The Holidays haven’t been kind to San Jose. 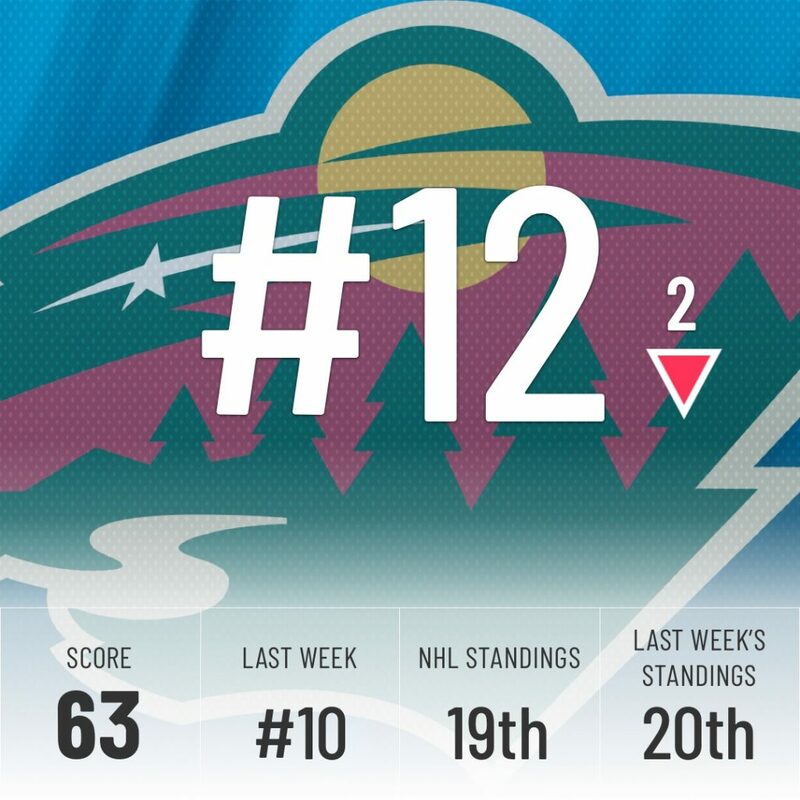 Since our last Power Rankings, they’ve lost to the Kings and Coyotes. 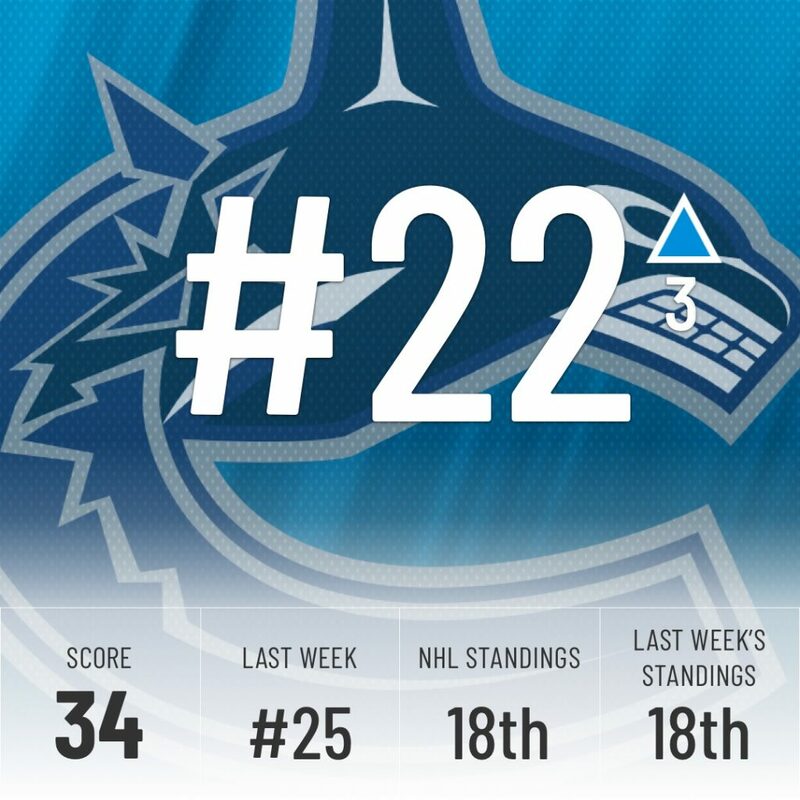 That’s not a sign of the 3rd-best team in the NHL and the Super Computer has unsurprisingly moved them down. They have a chance to make their way back up quickly with a big game coming up on Saturday against the Lightning. The Preds finally snapped a six-game losing streak with back-to-back wins on New Year’s Eve and New Year’s Day. Injured players are slowly making their way back to the lineup and, as they get healthier, should return to form as one of the league’s elite. 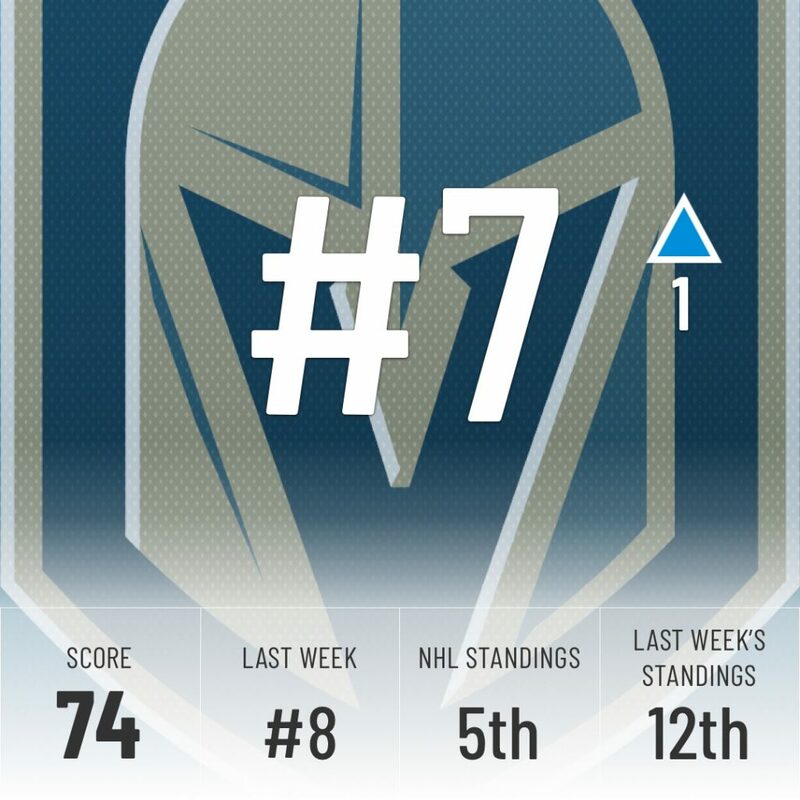 The Golden Knights keep climbing up the Rankings week after week and they’re currently riding hot on a four-game win streak. 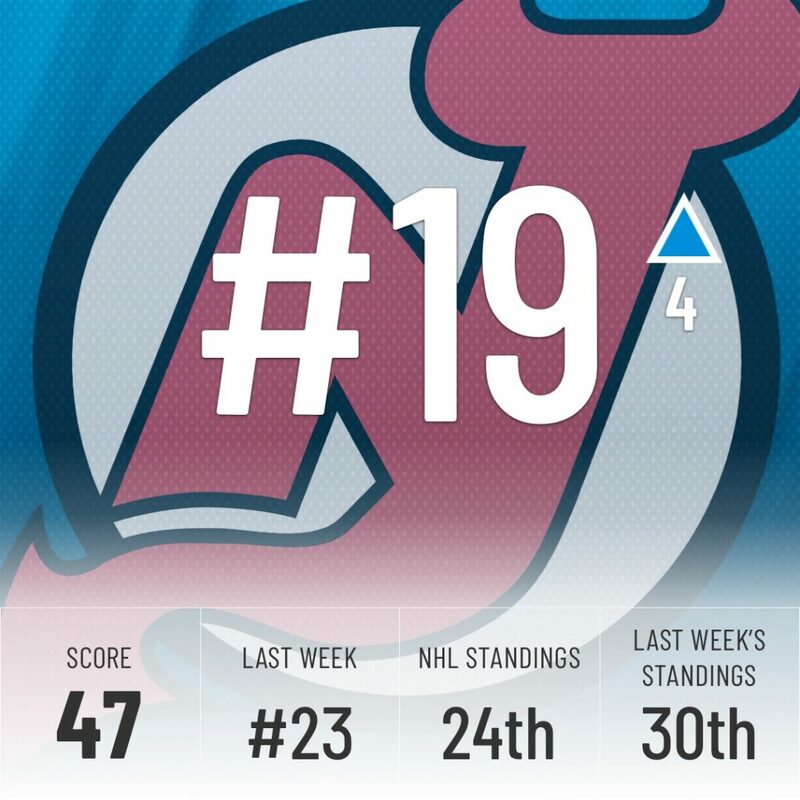 The Super Computer is still cautious about this team, slotting them a couple of spots lower than their place in the NHL standings. The stellar play of Marc-André Fleury is a key reason why. He currently leads the league in wins with 23 and has twice as many shutouts as anyone else in the NHL. Talk about Flower Power! 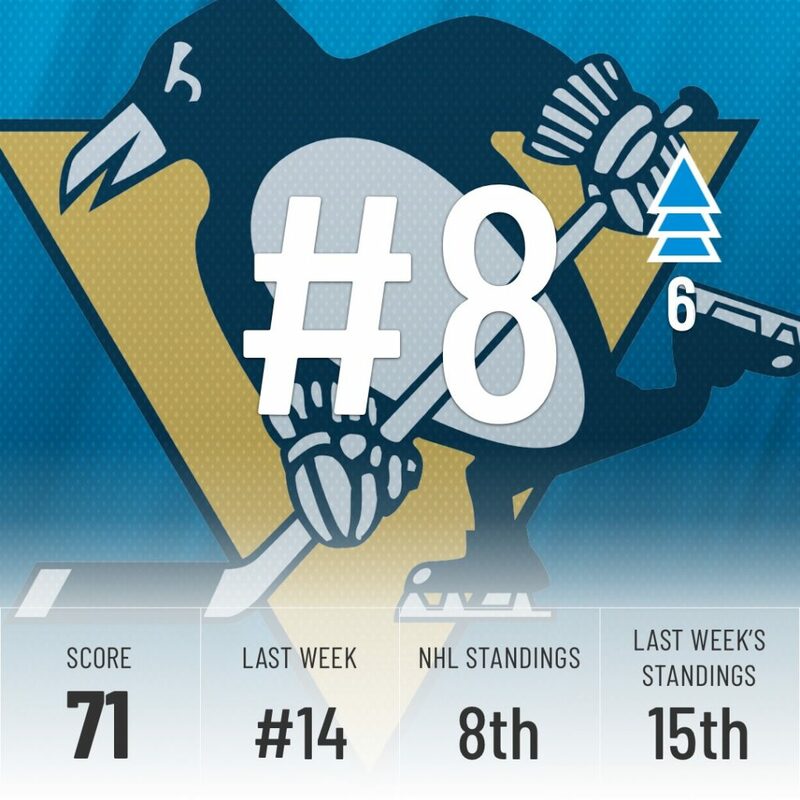 One of the biggest risers of the week, the Penguins appear to be back to their usual, dominant self after spending the early season on the fringes of the playoffs. They’ve now won their last seven and nine of the last ten games. We should know better than to doubt Sid the Kid by now. Is Alex Ovechkin ever going to slow down? He’s on pace to reach 60 goals for the second time of his career. At age 33. If he keeps up that pace, he would be the oldest player to reach that mark in NHL history. 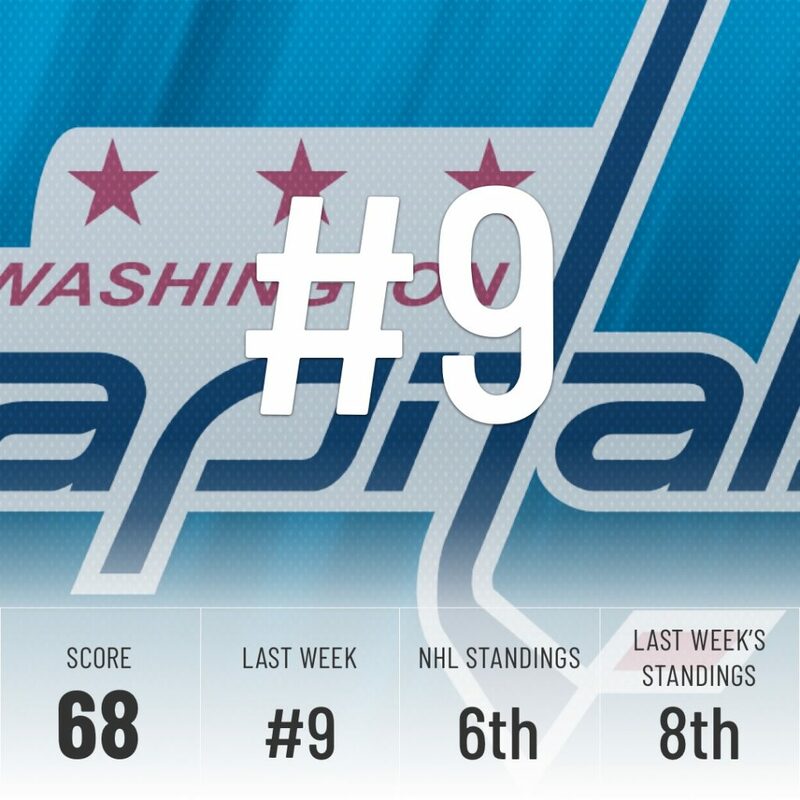 Oh, and the Caps are also first in their division if that’s the kind of thing you’re looking for in Power Rankings. 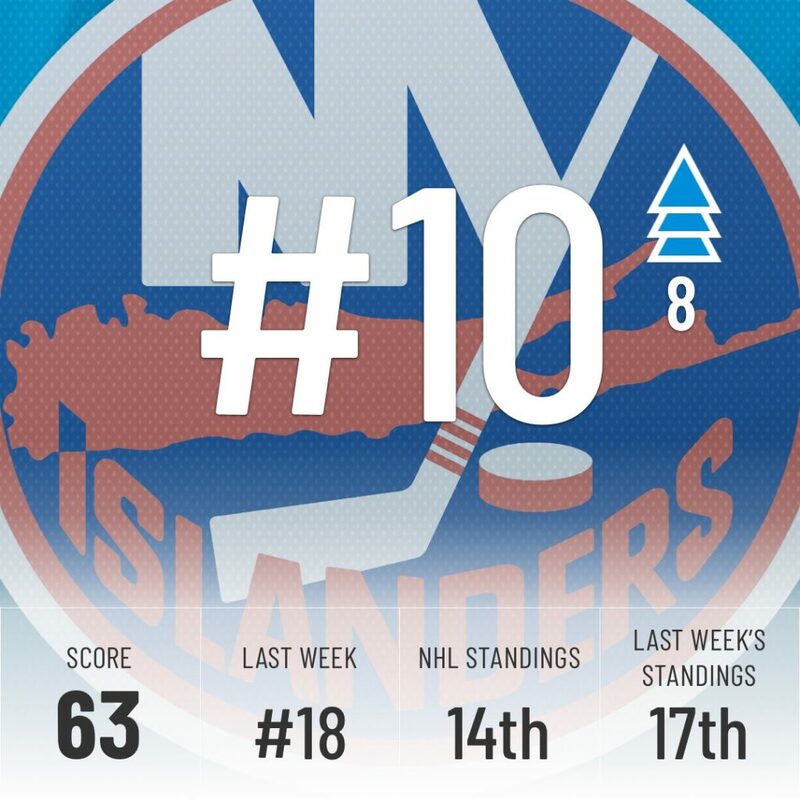 The biggest movers of the week, the Islanders jump a massive eight spots in our Rankings. 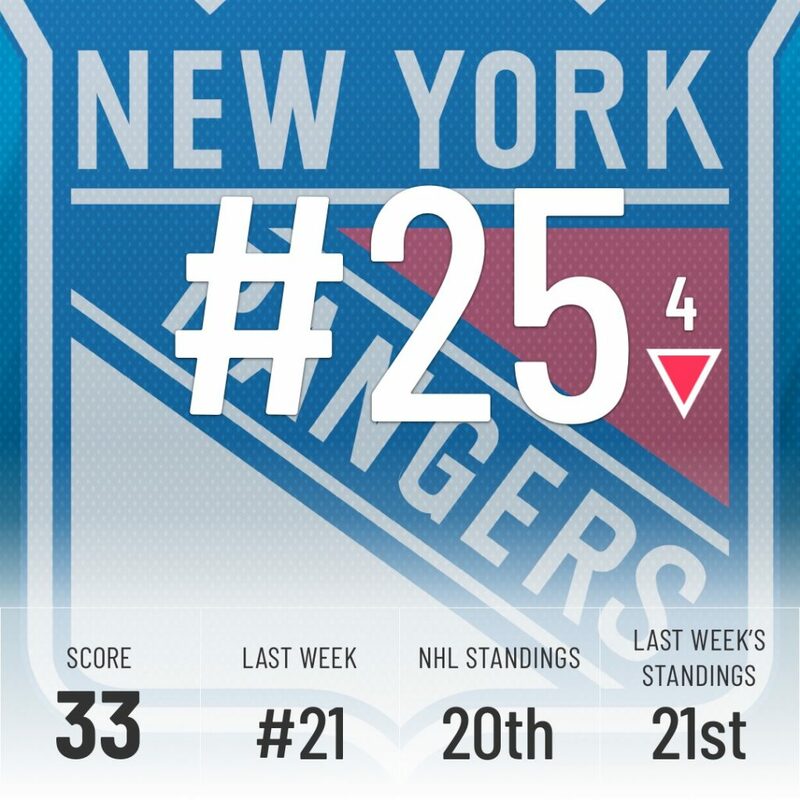 They’ve impressed the Super Computer with five wins since our last Power Rankings, including a statement 4-0 win over John Tavares and the Maple Leafs. They’re still in the thick of the playoff hunt at the start of 2019, not something many expected at the start of the year. Not surprisingly, Barry Trotz is one of the three finalists for the Jack Adams in our mid-season awards. Four wins against teams in the bottom half of our Rankings and a loss against the only top-10 team they faced. 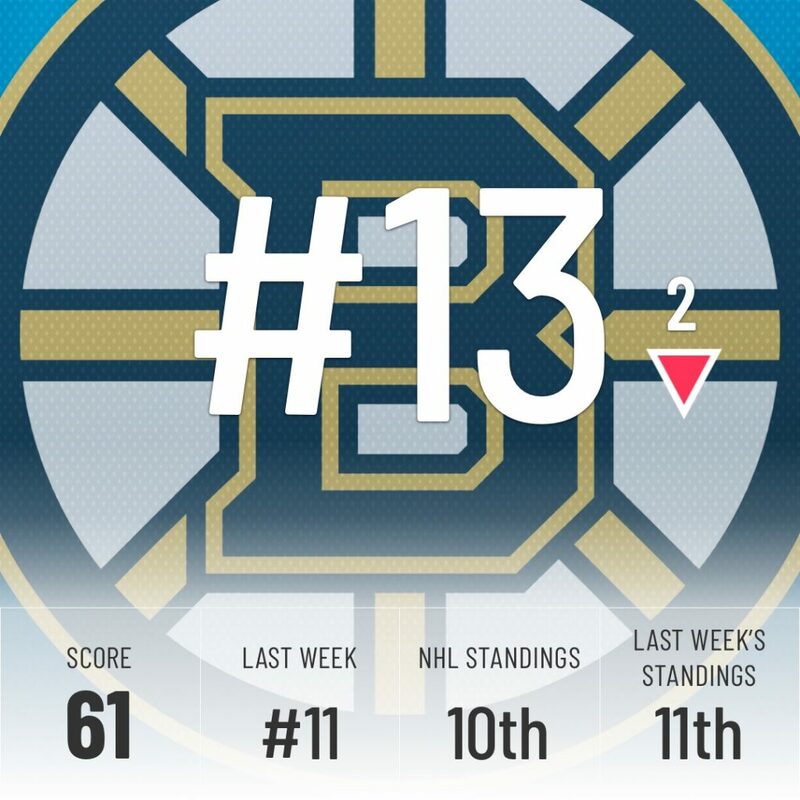 Good for the NHL standings, but not enough to impress the Super Computer and justify a bigger jump than one spot. They’re clinging to the last playoff spot in the Metro, but the Islanders are red-hot and just one point back. It’s going to be an interesting battle. What should have been a statement win yesterday over the Leafs now has an asterisk next to it, since Toronto was missing their top two goalies. They also beat the Jets but lost to the Blackhawks. That up and down play doesn’t earn the trust of the Super Computer, who moves them down for the second straight time. The Bruins will gladly take a small slip in our Rakings if it means Patrice Bergeron is back and healthy. This sequence during the Winter Classic encapsulates everything he brings to this team. He is our pick for the Atlantic’s Last Men In for the All-Star game and we have no doubt he will lead the Bruins back up the standings in no time. 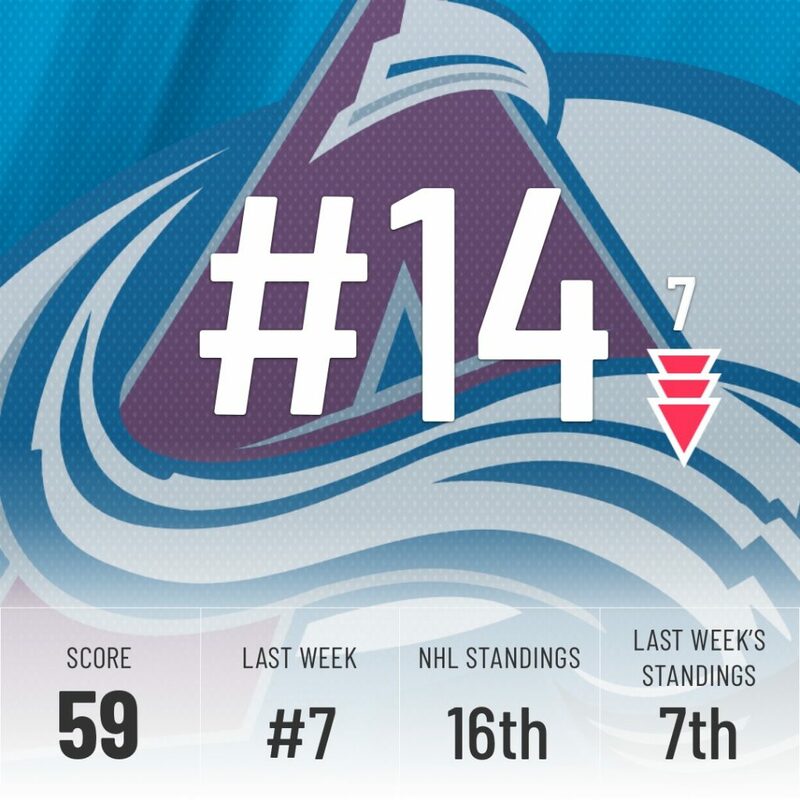 The Holidays weren’t kind to the Avs. They’re this week’s biggest fallers and losers of their last six straight. Now that they’ve had time to digest their turkey dinners and hopefully shed those Holiday pounds they can get back to speed because this losing streak has already dropped them into a wildcard position. 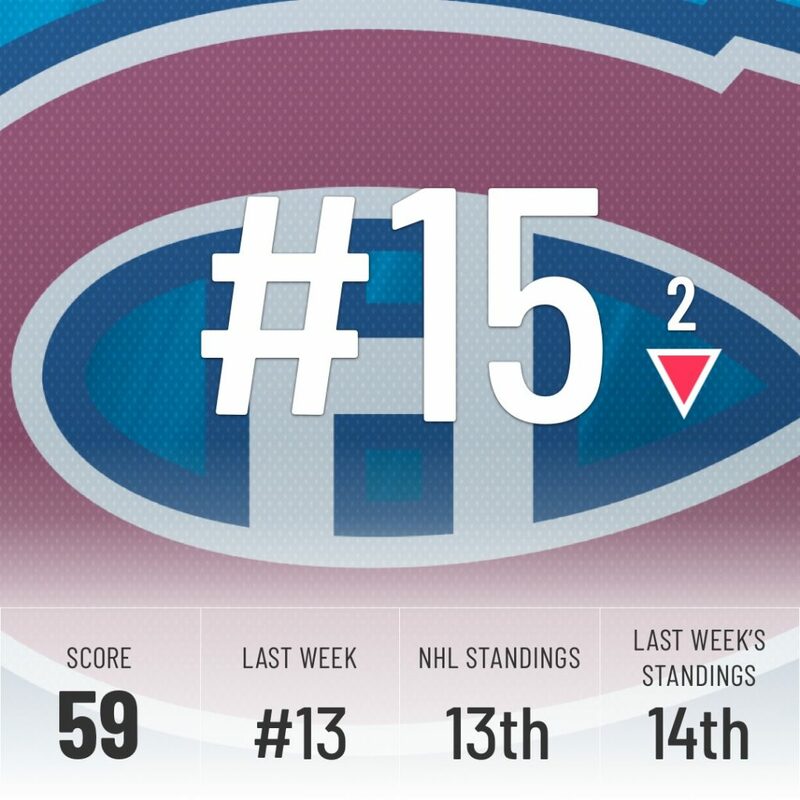 The Canadiens are still clinging to the last wild card spot in the East, but the Super Computer has trouble trusting this group. A big reason why is their meager +2 goal differential, better than only two teams currently in a playoff spot. Week after week, the story remains the same in Carolina. They generate high-quality chances as regularly as some of the best teams in the NHL, but they still can’t convert to save their lives. They’re one of two teams who have yet to score 100 goals on the season despite ranking second in scoring chances per game. 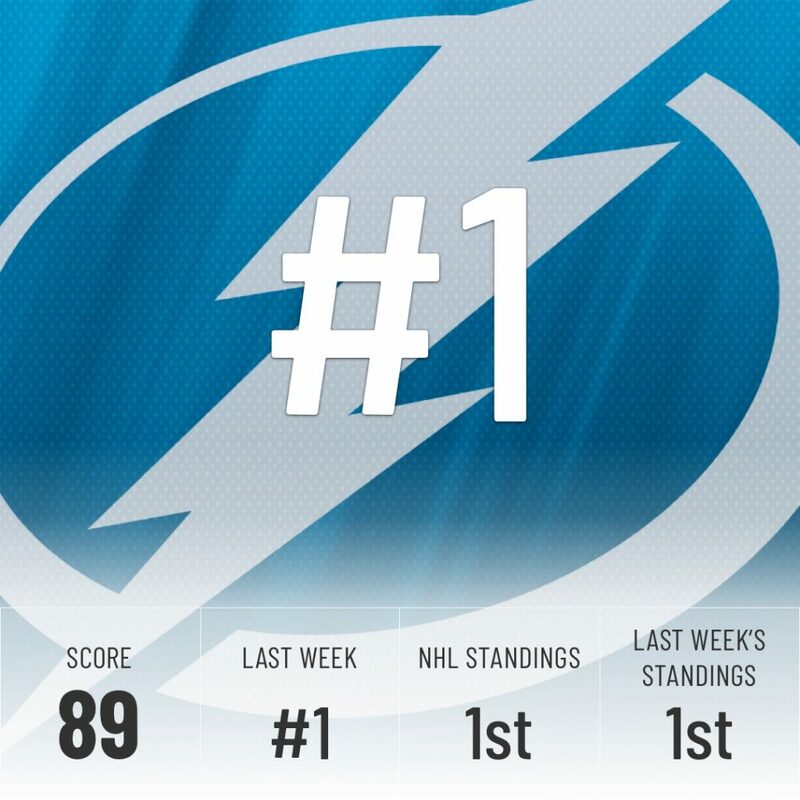 It’s getting really frustrating to see, but the Super Computer still believes they are better than the standings indicate. The Panthers must be having flashbacks from last season. 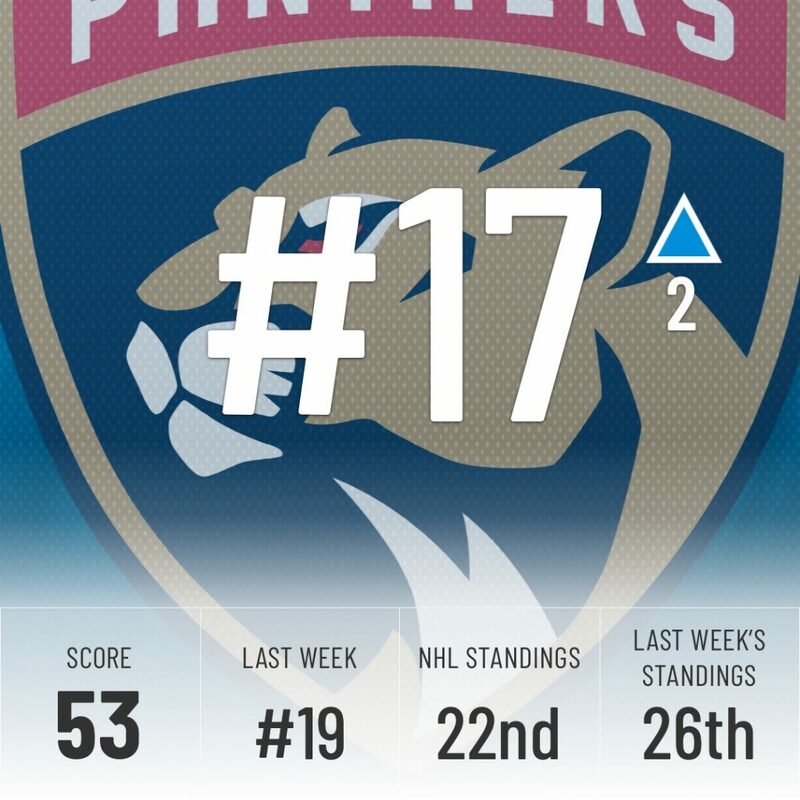 They’re still a team filled with elite talent, led by Alex Barkov, who’s also getting some love in our mid-season awards (#SelkeBarkov), but they just can’t seem to string together enough wins to get in the playoffs. Goaltending is still an issue with Roberto Luongo in and out of the lineup and James Reimer underperforming. Injuries to Vincent Trocheck and Nick Bjugstad aren’t helping either, but the bottom line is the Panthers just aren’t good enough right now. 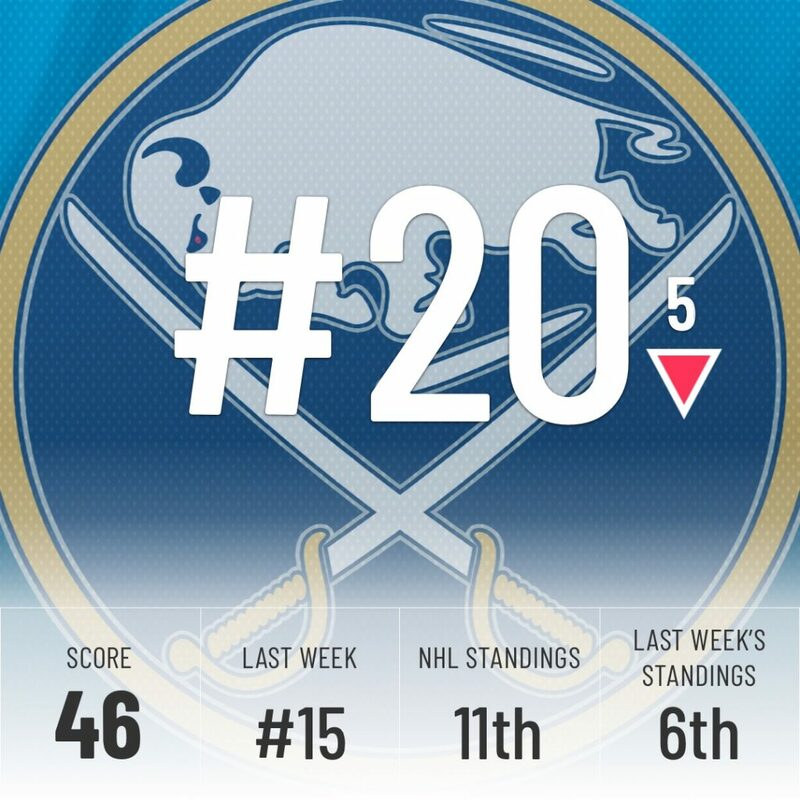 Buffalo continues to fall back to earth after their early season success that skewed many fans’ expectations. Buffalo was last in the NHL just a year ago, after all. This year was never about making the playoffs, although doing so would be a nice bonus. No, this year was about showing some growth and we’ve seen that in spades this season. We detailed here why The Sabres should still be optimistic about their future, with “future” being the key word. Connor McDavid is good at hockey. Moving on. 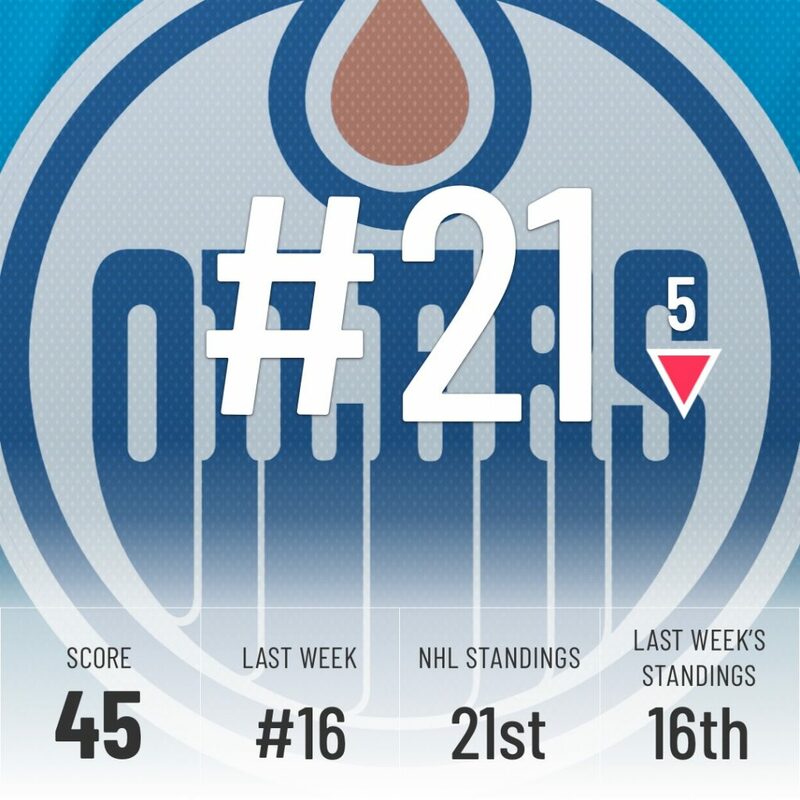 But more seriously, the Oilers were dealt a tough hand during the Holidays. They had to face Tampa Bay, San Jose, and Winnipeg, which stretched their losing streak to six games. 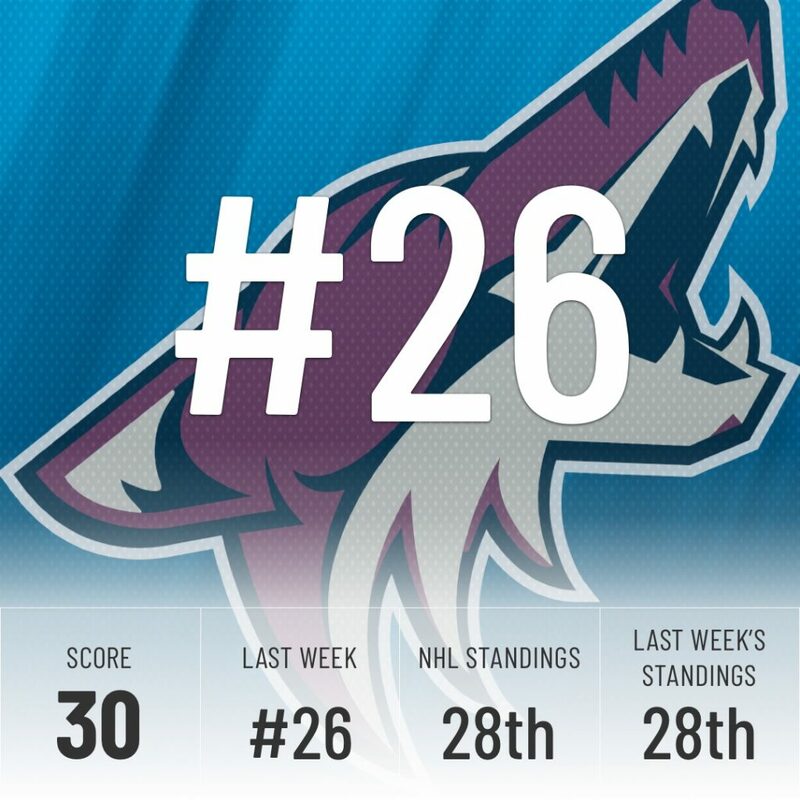 They started the new year by snapping the streak with a win over the Coyotes. Let’s hope this is a good sign for the rest of the year. 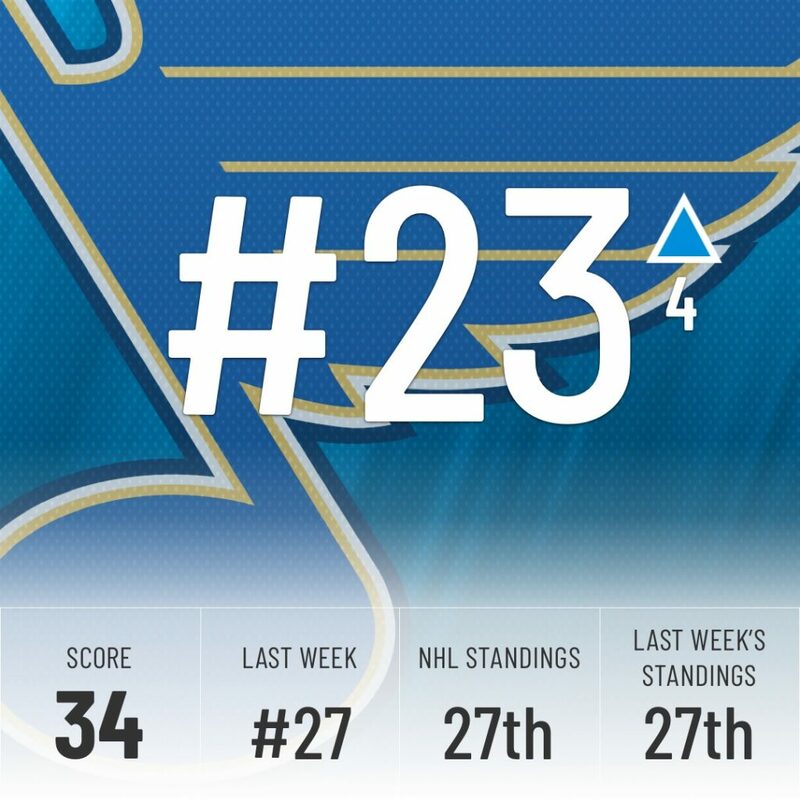 The Blues were able to put together some quality wins against the Flames and Capitals, but it feels like too little, too late for them. They’re still ten points down from the last wild card spot with a roster many expected to compete at or near the top. The Super Computer still gave them a nice, four-place bump in our standings, so that’s a silver lining for them I guess? In their most recent game, the Rangers fell victim to the white-hot Penguins who gave them a 7-2 beatdown. Luckily for them, they can always fall back on their rebuild statement made last February. If the Rangers are serious about their rebuild they could be a big mover at the trade deadline. The Coyotes continue to be plagued by injuries with Nick Schmaltz being their latest player to be put on IR. He joins a list that includes their starting goalie, Antti Raanta, and their top penalty killer, Michael Grabner. It’s probably too little too late for the ‘Yotes, especially with so many players out, but they could be an interesting team to watch for next year. 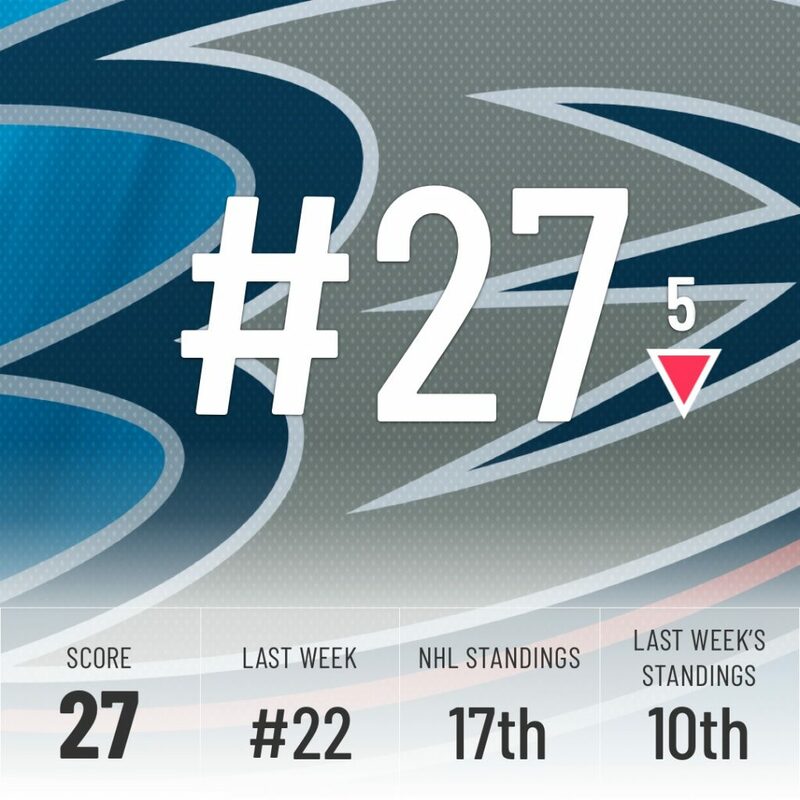 The Ducks continue to be a low-scoring team that thrives or dies off their goaltending. Luckily for them, they have John Gibson who we have as our Vezina Trophy winner at the halfway point of the season. 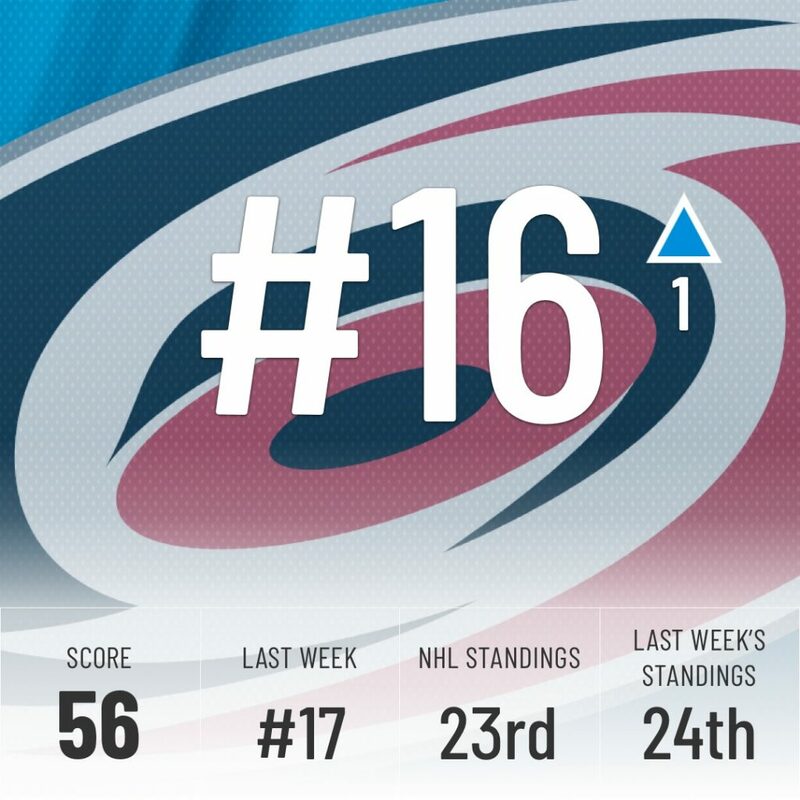 After a weak holiday showing and a 6-game losing streak the Super Computer is once again ranking them down the standings. 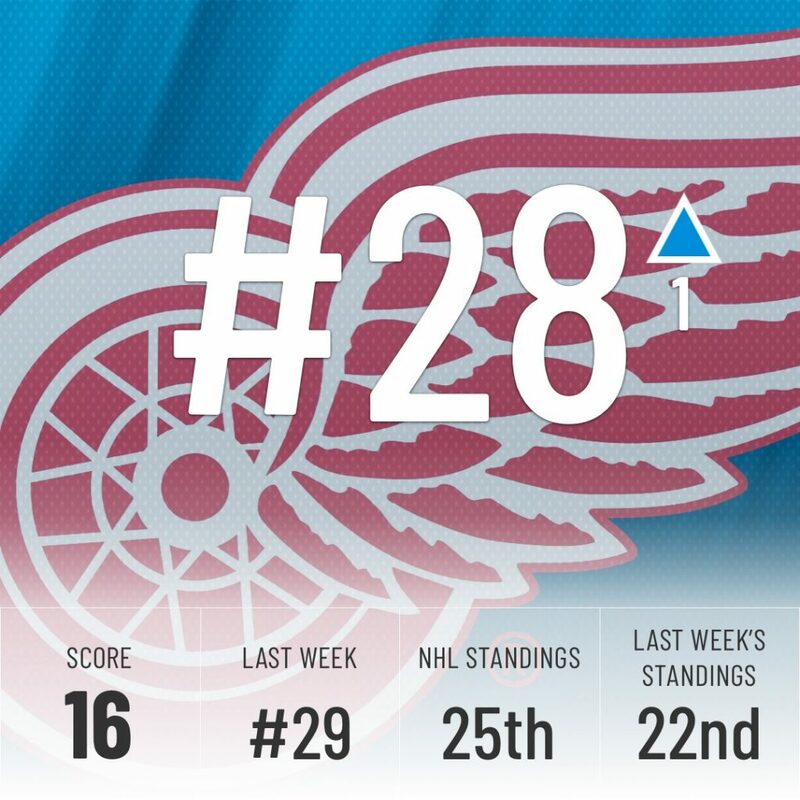 With only one win in their last 10 games, the Red Wings are looking like they’re going to be a big-time seller at the trade deadline. They have some good young talent that can be built around but this team isn’t ready to be competitive yet. If they can get some good assets at the deadline they could turn it around quicker than anyone might expect. At least Dylan Larkin is playing better than ever. Who are the 5 best puck carriers at even-strength? Think about it. The Blackhawks had a decent holiday run, going .500 in their 6 games. 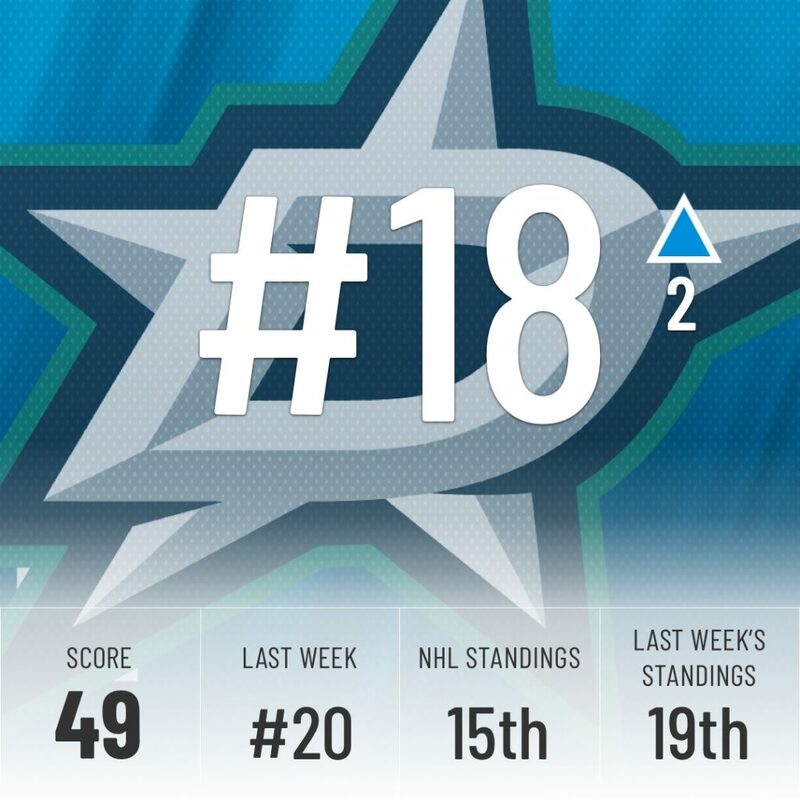 That was good enough to slide them up the league standings but the Super Computer isn’t in a giving mood and only moved them up two spots due to the Kings and Senators being worse than them. Not to mention their starting goalie, Corey Crawford, looks to be out long-term with another concussion. Finishing out December in style the Kings went 5-1 in their last 6 games but then the new year began. In January, they have two losses with a combined -6 goal differential. 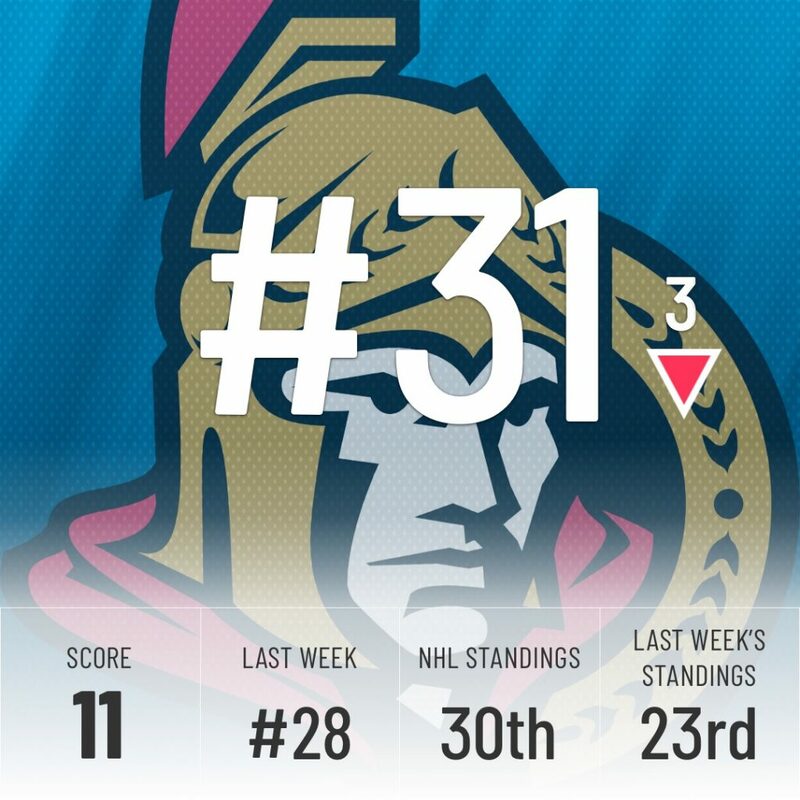 The Super Computer’s giving them some love by ranking them above the Sens but we all know at this point they won’t be moving too far from that coveted 31st spot. The Sens have had a rough holiday season. 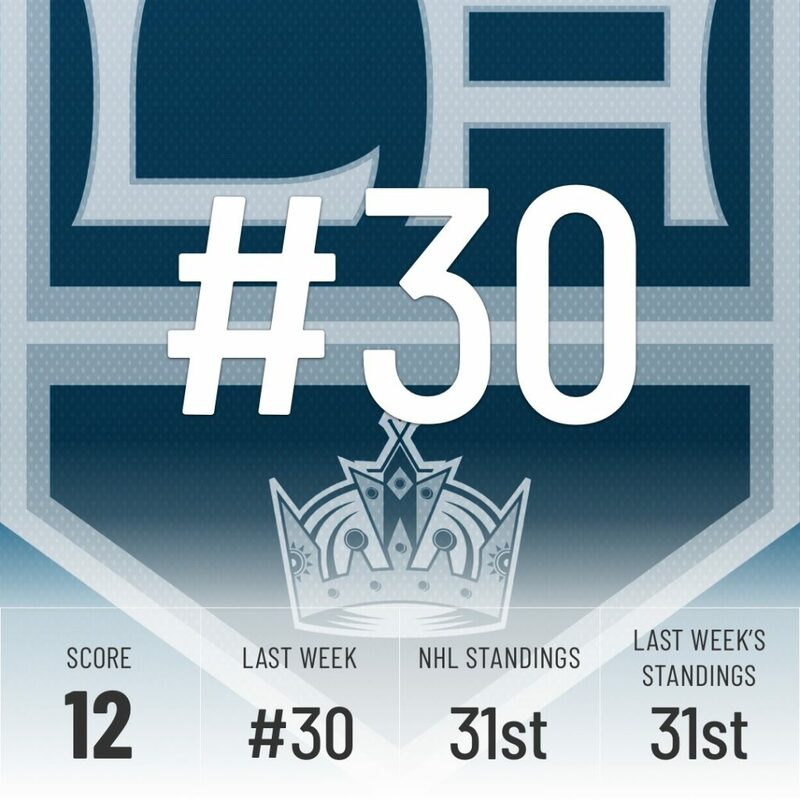 0 wins in their last 6 games have dropped them into a tie for last in the league but with one less game played than L.A., they get the honor of placing 30th. 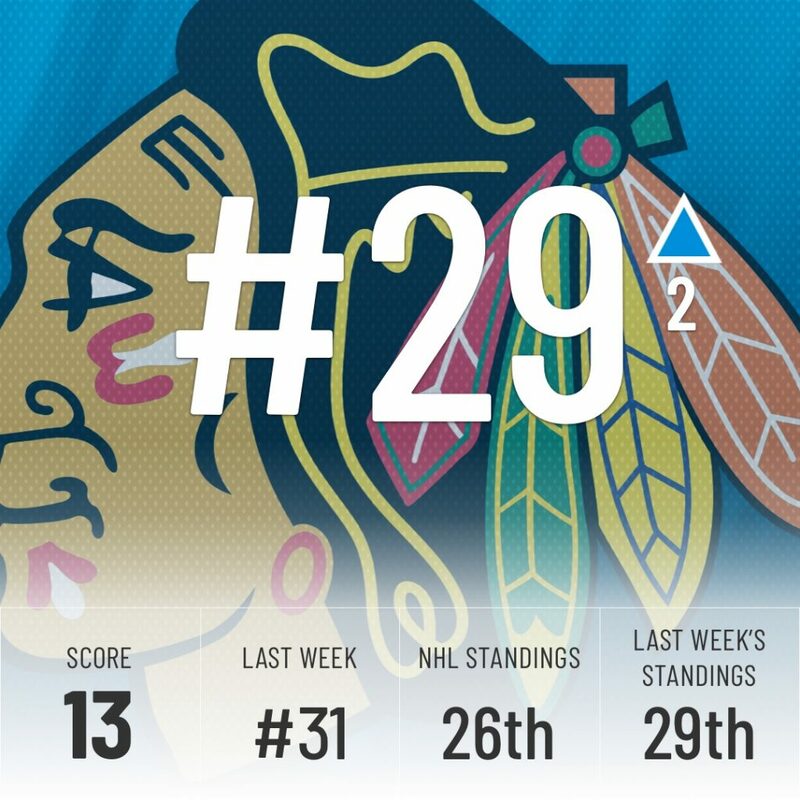 The Super Computer isn’t so easily fooled though and see’s the Senators’ woes continuing and has them ranked last in the league.